This pathway provides guidance on the staging of patients with bladder cancer confirmed with histology. 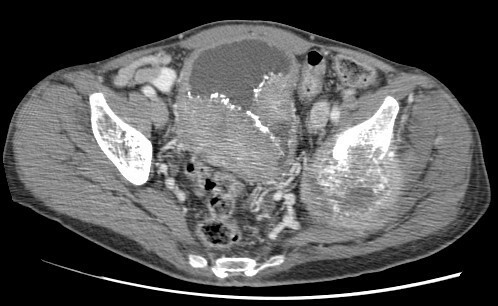 Images 1a & 1b: 77yo M had an incidental bladder mass detected on CT abdomen. 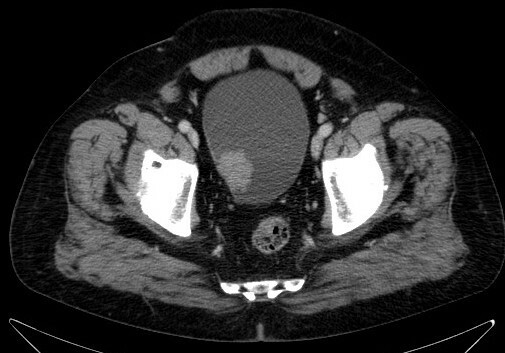 Patient underwent TURBT & pathology confirmed low grade papillary TCC with no evidence of stromal invasion. Stage: T2N0M0. 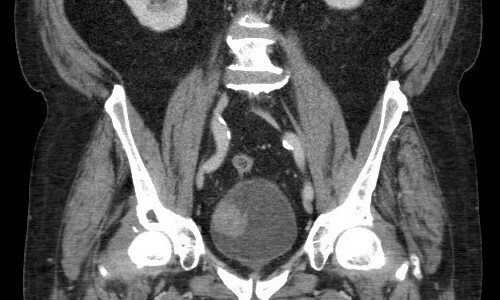 Images 2a & 2b: 66yo F with history of recurrent TCC of bladder & left ureter. 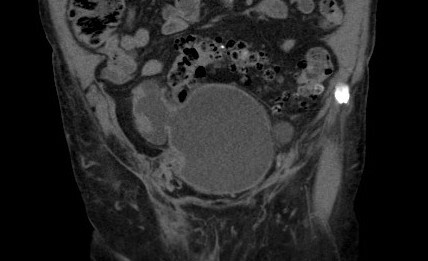 Follow-up CT shows left-sided posterolateral bladder tumour invading into adjacent ileum. No lymphadenopathy or distant metastatic disease was seen. Stage: T4N0M0. Images 3a & 3b: 91yo M presented with frank haematuria. 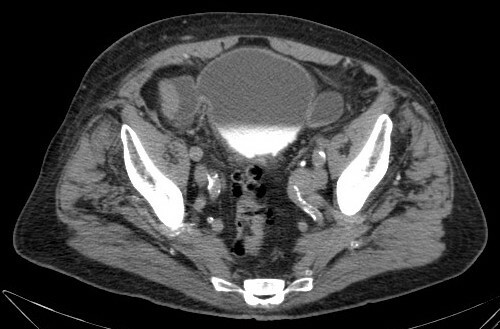 CT urograph showed a bladder with thickened walls and bilateral diverticulae. 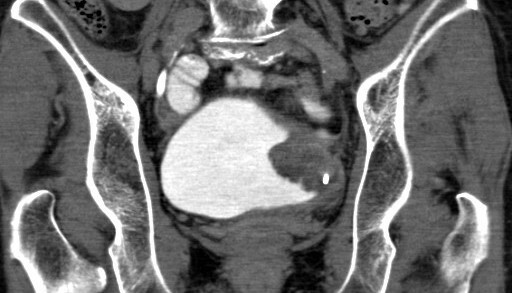 The larger right diverticulum had nodular wall thickening of its lateral wall. The patient later underwent open diverticulectomy. Pathological findings were of TCC with squamous differentiation. Stage: T3N0M0. Images 4a & 4b: 60yo M presented with left hip pain, with initial plain films showing a mixed lytic-sclerotic lesion of his left femur & pelvis. 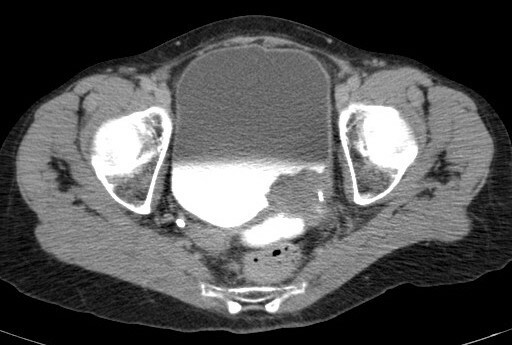 CT abdo/pelvis showed multiple large calcific tumours within the bladder, obstructing the left ureter & causing hydronephrosis. 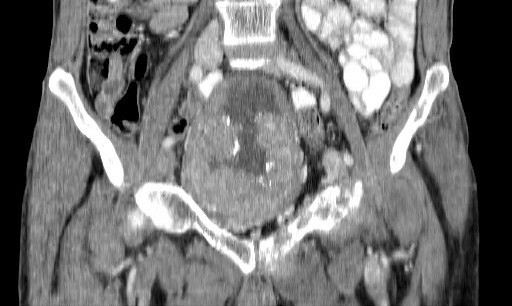 There was a large metastatic deposit involving the left hemipelvis and acetabulum. Pathological findings showed high grade TCC with squamous differentiation. Stage: T4N0M1. Edge SB, Byrd DR, Compton CC, Fritz AG, Greene FL, Trotti A, editors. AJCC cancer staging manual. 7th ed. Chicago American Joint Committee on Cancer. c2009. pp497-502. Battista G, Sassi C, Corcioni B, Bazzocchi A, Golfieri R, Canini R. Latest developments in imaging of bladder cancer. Expert Rev Anticancer Ther. 2010;10(6):881-94.